The authority on all things Nintendo, and more! Fun fact: Freedom Planet, by GalaxyTrail, was originally supposed to be a Sonic fan-game. 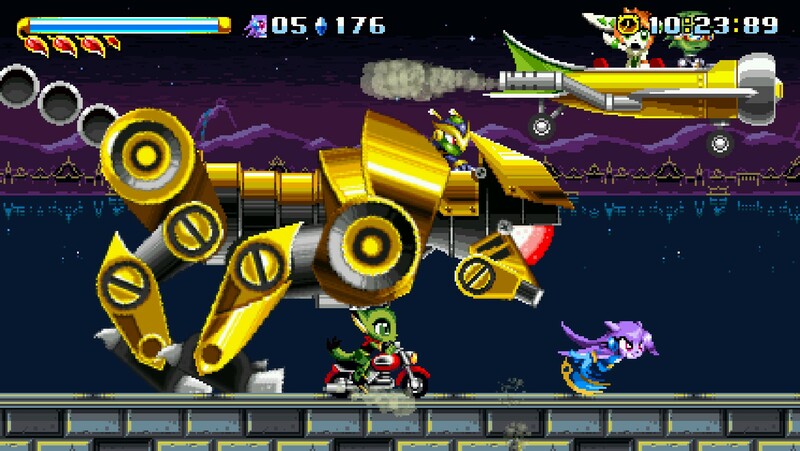 However, the developers decided to scrap that idea in favor of creating a more unique game, and the result of that is Freedom Planet. In Freedom Planet, you play as 3 different characters: Lilac, Carol, and Milla. Each character has their own attributes and abilities that allow for different styles of play. Lilac is able to dash, use cyclones, and various attacks to run through levels and defeat enemies. Carol doesn’t run as fast, but she’s able to use a larger variety of attacks to defeat enemies and she has access to a motorcycle power-up which lets her move extremely fast and take down enemies with ease. Then finally, there’s Milla who is able to do a flutter jump in the air and can use her shield to protect herself from enemy fire, but she can only attack by using a weak laser beam and a block she can throw at enemies, which takes a while to charge up. This makes each character unique and allows for different styles of play when playing with each character. Not only that, but the levels in Freedom Planet are very creative and fun to play through! Even though there are only a total of 10 stages in the game, Each level can take at least 10 minutes to beat and at most around 20-25 minutes. There’s a lot to do in each level whether it be defeating enemies, collecting gems, finding hidden collectables,, or even just going through the level normally. The level design is on point, and feels suited for each character’s playstyle. That said, I would be doing a huge disservice if I didn’t mention the boss fights. Each one has you fighting either a giant mech/creature, one of the main enemies in the game, or one of those enemies while they are controlling a giant mech/creature. Each boss tests your reflexes and skill of the game and If you’re not paying attention to what you’re doing, then prepare to die. A lot. There are tons of explosions and crazy attacks that happen during these boss fights, which kind of give you a sort of Gunstar Heroes vibe. I won’t spoil too much about the end of boss fights, but let’s just say that it feels very satisfying when you defeat one. Then there’s the story, which while not incredible, was still memorable and enjoyable.The plot is about how the planet is powered by an artifact called the Freedom Stone, and how an evil being known as Lord Brevon is planning on using it to increase his army to take over the planet, while also killing the father of Prince Dail who has now raged war against the three continents of the planet. Meanwhile a starship commander named Torque is on a mission to prevent Lord Brevon from getting a hold of the freedom stone and Lilac and Carol get involved and decide to help stop Lord Brevon. During their adventure, they come across Milla and let her join them on their journey. Not only that, but depending on which character you play as, the story will change, which gives each character more meaning and personality too! For the most part, the story takes itself pretty seriously and it has some really intense moments in it, but it feel a bit pointless at times, and the sometimes awkward dialogue certainly doesn’t help. But overall, what do I think about Freedom Plant? It’s amazing! The gameplay is extremely exhilarating and fun, the different characters and playstyles are great, the story is memorable, the game (on the Wii U at least) runs at a very smooth 60fps in 1080p with no technical problems, and the music is extremely enjoyable and memorable! I highly recommend this game, especially if you love platformers or you like 2D Sonic games, for $15 you’re truly getting your money’s worth (and if you downloaded the demo on Wii U during the Nindies@Home event, then you get the game for $12.74 instead, which gives you even less of a reason not to get it)! Overall, I really liked Freedom Planet. Is it worth the price? : Absolutely! I would recommend it to: Sonic fans, platformer fans, and people who like challenging games. Next Post Shovel Knight and Chibi-Robo! Amiibo are Apparently Compatible with Super Smash Bros.